Presenting a beautiful, maintenance-free and affordable line of outdoor furniture for your home. Poly Lumber Furniture from Weaver Furniture Sales. The furniture is made of recycled milk, water and juice containers. But you wouldn’t know that from looking at the furniture. Because Poly Lumber Furniture has the appearance of wood. Also, craftsmen assembly it with stainless steel hardware. And they reinforce the furniture with aluminum angle braces. What’s more, Poly Lumber Furniture is termite resistant, UV stabilized and will not promote bacterial growth or mildew. So it’s great for the outdoors. And to top it all off, the furniture has a beautiful appearance. As a result, you and your family will experience years of carefree enjoyment with outdoor furniture that enhances to appeal of your home. So check out the Poly Lumber Furniture pieces below. And visit Weaver Furniture’s ‘brick and mortar’ store in Shipshewana, Indiana. And see our outdoor furniture in person. The collection of Poly Lumber Furniture shown above is part of a large array of Amish-built, custom-made, solid hardwood furniture products for the home. In fact, we offer furniture for every room in your house. 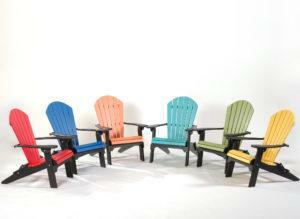 So choose your favorite Poly Lumber pieces for your outdoors. Then, browse this entire website to find out how we can add comfort, convenience and style to the rest of your home. Also, if you have any questions about our products or how to order, feel free to talk with one of our knowledgeable furniture consultants.